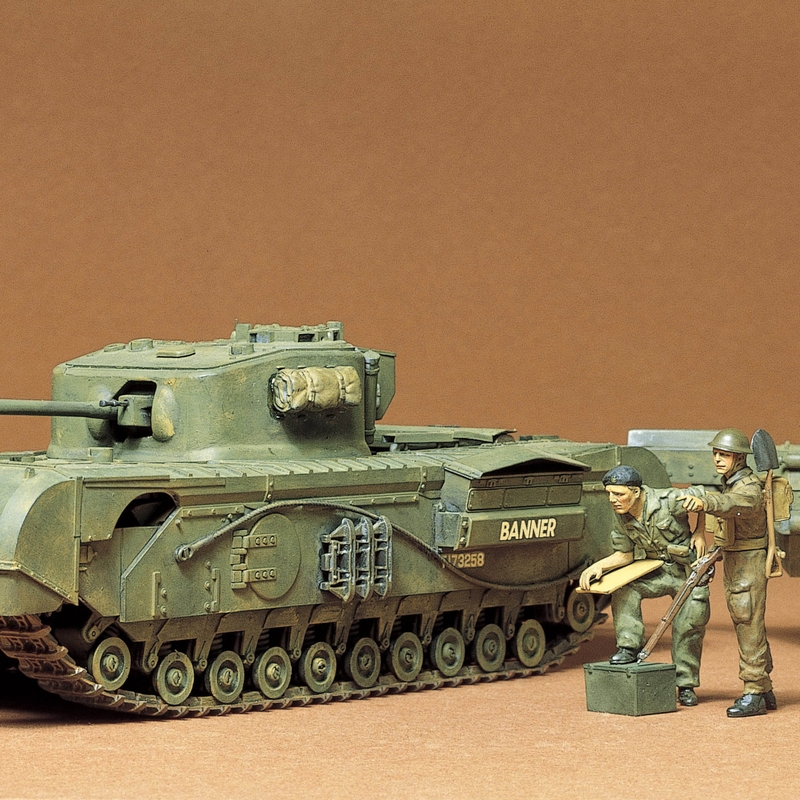 This is a re-issue of the classic 1/35 scale model kit of the Churchill Crocodile, a flame-thrower variant of the Churchill Mk.VII infantry tank named for the famous British Prime Minister. It retained the 75mm gun of the standard Mk.VII, replacing the front machine gun with a flame-thrower, and towing a trailer containing fuel and compressed nitrogen; it had a flame throwing range of 82 meters. Around 800 were produced during WWII, and their destructive power was particularly harnessed in support of U.S. infantry, as American forces did not have a flame-thrower tank of their own. Special Feature 1 Total length with trailer attached to tank: 340mm. Special Feature 2 This kit can also be assembled to recreate the standard Churchill Mk.VII infantry tank. Special Feature 3 Realistic horizontal and vertical movement is provided by the joint between tank and trailer. Special Feature 4 Trailer maintenance hatch can be assembled in open or closed position, and interior details such as valves and tanks are partially recreated. Special Feature 5 Includes infantryman and tank man figures in realistic pose.